Plate washer. Manual Elisa Plate Washer. Ideal for small scale. CappWash plate washer is an ideal elisa plate washer for small scale work. Simple, compact and inexpensive, Capp plate washer is available in an 8-channel, a 12-channel and a 16-channel version, as well as in form of a 6-channel TubeWash - manual washer for 12x75mm test tubes. Fitting into even the tightest budget, Capp plate washer is a perfect alternative to dependence on department washers for washing micro plates and strips. Capp elisa plate washer works most effectively with a vacuum source. Capp provides a vacuum pump, suitable both for the 115V and 230V connections. Capp plate washer can be purchased individually, as a set, including all components necessary for the set up, or with chosen components only - depending on your current lab infrastructure. Below chart shows all available components for Capp plate washer. 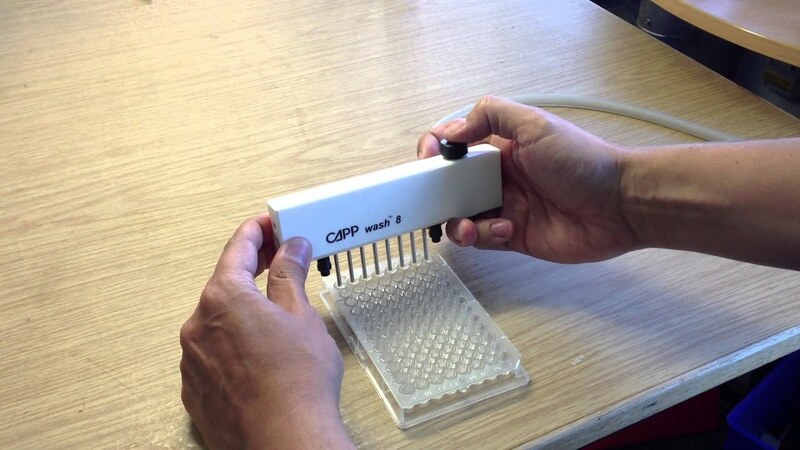 Capp elisa plate washer requires no programming nor electrical wiring connections. It is made of a high-grade stainless steel and polypropylene, making it fully autoclavable and highly resistant to aggressive chemicals. The unique Two-in-One Design of Capp elisa plate washer gives each tube 2 functions - delivery of the washing solution to the well and aspiration of the used solution back to the waste collection bottle. This is possible as each tube of Capp elisa plate washer consists of an inner tube that releases the distilled water washing solution into the wells for rinsing while the outer tube vacuums away the liquid upon completion of the washing procedure. The washing process with Capp plate washer is as simple as it can be: Simply lower the tubes into the well then push the knob to fill and release the knob to empty. Now repeat for the desired amount of washings and move on to the next row. Capp elisa plate washer is suitable for all well types. The plate washer can be set to the desired depth very easily by simply adjusting the two screws found on either side of the tubes. Convince yourself how easy it is to work with Capp elisa plate washer and contact us for a free unit for testing. Ideal tool for low scale and reliable ELISA plate washing. Simple to use and economical, users can choose to simply order the manifold or the complete set, which includes a vacuum pump, bootles and tubing. Hold the manifold towards the plate and press the button to dispense the washing solution. Release the button to aspirate the liquid, which will go directly to the waste collection bottle. The 2in1 tube design prevents the channels from clogging. Hand held work allows the user to perform a more qualified washing of the plate, compared to automated washers. Silicon Tubing (1 meter). Recommended to order 3 meters / 6 mm inner and 9 mm outer diameter. 1,5 mm wall thickness.